LAWRENCE— Trenton parents and youth head to Rider University to sharpen their business skills. Sunday afternoon, Anwar’s Reflections— a Trentonian affiliate— attended a parent-student orientation for the Minding Our Business (MOB) Program at Rider University. The MOB program is designed to give Trenton area youth from the 6th, 7th, and 8th grade, the opportunity to develop their business and entrepreneurial skills during the summer while school is out. Each student is trained on how to start and run a business. The program was launched in 1997 and is celebrating its 15th year in existence. 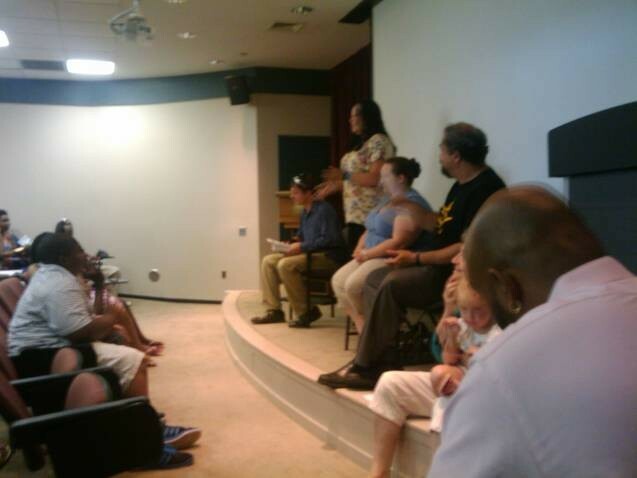 During the orientation, parents and children alike were informed about the rigors of the program. From attending reading and math classes to creating a business plan, the students have their work cut out for them. Yet the program also gives the children to play and have fun in a safe environment. Dr. Sigfrido Hernandez, the director and founder of the MOB program, said that the program is important because “in working with urban youth in Puerto Rico, I realized that they don’t have the same opportunities for growth that young people that are more affluent have. I think urban youth should have the same opportunities”. Martha Higginbotham, a reading specialist for the MOB program said that she enjoys working with the teenagers. She said, “this is so much fun for me”. Samantha Carnasee, a graduate of the program, said her decision to get involved in the program was one of the best decisions she ever made because in the end she learned entrepreneurship and running her own business and making her own money. While enrolled in the program, Carnasee says that she created Layla’s Pizza Twists, a small business where you get pretzels and pizza with various toppings. For more information on how to get involved, please contact Dr. Hernandez at 609-895-5509. TRENTON— Every now and then, old things become brand new. 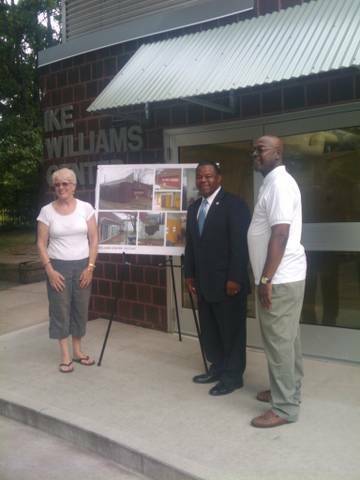 Today, Anwar's Reflections— a Trentonian affiliate— attended the grand opening of the Ike Williams Community Center in Mill Hill's Clay Street Park located in Trenton. The city's mayor—Tony F. Mack— along with north ward councilwoman Marge Caldwell-Wilson were on hand to do a ribbon cutting and give area residents a tour of the newly renovated facility that had been closed for the past six years. The Community Center’s namesake— Ike Williams— was a famed boxer from Trenton that won the NBA World Championship belt in 1945. Improvements were made both to the interior and exterior of the building. From new lighting and flooring to the addition of a kitchenette, improvements were seen. New courtyard doors were also installed. The facility was refurbished by the Geo Matrix Construction Corporation. The facility is designed to give children and citizens alike the opportunity to meet, play, and have fun in a safe environment. The mayor said reopening this center is important because as so many young people will be out of school over the next week or so, they need a safe place to go to. Mayor Mack said, "I believe it’s our responsibility as government as citizens both private and public to offer opportunities for young people to be involved while they are out of school. It is our job to make sure they are busy, that their minds are occupied, and that they have a safe haven to enjoy. So I am excited about it. For many years, almost six years I believe, this place has been vacant and dormant. We wanted to change that". In light of recent reports indicating that there is a citizen-led committee currently working to recall him from office, Mack said he is going to focus on things he and his administration can control. He said he is going to keep on working and provide the services that our taxpayers elected him to provide. Mack said, "We'll keep opening buildings, we'll keep paving streets, we'll keep our trash collection to two days a week, we'll continue to cut down that $55 million deficit, and we'll let the chips fall where they may". TRENTON– A story of adversity and perseverance was on display Wednesday afternoon at the Triumphant Life Community Church in East Trenton. 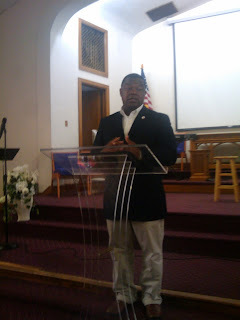 Mayor Tony Mack was on hand to do a public reading of his new book, Detours to Destiny: Life Under Construction. Excerpts of the autobiographical book were read. Mack spoke before a crowd of around 30 spectators. In a press release, it was stated by the online committee--Stand By Tony--that the new book is a roadmap of obstacles and triumphs. During his presentation Mack discussed a variety of things including his deceased father-- Thomas Mack. The mayor told a vivid tale of his father being hanged in Jefferson County Georgia Jail. Mack also went on to mention his upbringing in the city's Wilbur Section. He spoke about growing up poor and overcoming obstacles. Mack also recounted his college days at Howard University where he met by chance hip hop mogul Sean P. Diddy Combs. Mack also said that he was inspired to write the book due in part to reading President Obama's two book-- the Audacity to Hope and Dreams of My Father. He went on to say that he started writing the book for 4 years ago. According to Mack, he wrote it because of the tough times so many people are having. He said, "whether its economics, or whether its not having a job. I wanted people to know that despite all of your adversities, despite of all the ups and downs, despite the criticisms, in spite of what people might think you can become, you can achieve, that is the moral of this book". The mayor took questions from the media. He was asked whether the release of this book had anything to do with recent news that there is a committee forming to recall him from office. The mayor insisted that releasing the book at this time had nothing to do with the recall effort and that he had been planning to release the book a while ago. Linda Ransom of Trenton said she came to the event because she is an avid Mack supporter. She went on to say that Trenton cannot be changed overnight and that the Committee to Recall Mayor Tony F. Mack should take that energy they have to get 9,800 signatures and put into making a difference in the city of Trenton. Ronald Carter-- a city man-- said that he is a supporter of Tony Mack and that despite the mayor making some mistakes while in office he deserves a chance to correct those mistakes. Cleve Christie, a city man, said that he attended the book reading because he supports Mayor Mack.Christie went on to say that the accomplishments the mayor has achieved outweigh the setbacks or missteps that have occurred. Community activist Dion Clark stated that everyone has a story but this book doesn't address the issues facing Trenton. He said, "I could probably sell a few books myself, but that does not do anything about his [Mayor Mack's] property not being taken care of in the Wilbur Section. After the house caught on fire seven years ago, he did not fix up the property, the property needs to be bulldozed. This is what makes a ghetto. Dilapidated buildings, the blight, the crime". Clark went on to say that as a leader and a landlord, why hasn't the mayor taken care of these issues. He said Mack is from Wilbur Section, but he's not being part of the solution. 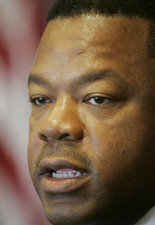 People are saying that if he [Mayor Mack] doesn't take care of his own property, why should I take care of my property". The book is scheduled to be released to the public sometime in September. The mayor indicated that the publisher is currently unknown and that he is currently working with two different publishers to see which one he will choose. TRENTON — Stories of duty and honor filled Trenton City Hall on Monday night as families, community activists, and concerned citizens came together to pay tribute to Trenton’s finest. Anwar’s Reflections — an affiliate of The Trentonian — attended the annual Trenton Police Departments Awards Ceremony, honoring the heroic deeds of Trenton’s men and women in blue. The event was sponsored by the Trenton Police Department and the awards committee. During the ceremony, 20 cops received commendation from their fellow officers. Some of these officers were recognized for their bravery, others for their selfless acts. Three individuals — Justin Brugnoli, Sean Freeman and Patrick Guido — were acknowledged for subduing an armed man at Ames Bar in Trenton. During the event, Officer Vito Renna was also honored for rescuing three passengers from a burning vehicle. He was recognized for his valor. A courageous city man by the name of Phillips helped police officers pull the three passengers out of the vehicle also. One of the officers wives, Priscilla Bunting, said her husband, Officer Mark Bunting, loves his job — and he is a great father. Bunting, a city cop for three years, received two commendations. Community activist Dion Clark said that despite not knowing any of the officers’ names he knew them by their face. He also said that crime is going to be crime, the police can only do so much and that it’s going to take the community to speak up when a crime is being committed. Clark said, "Tellin’ it ain’t snitching — it’s telling the truth”. Retired cop John Guido came out to see his grandson, Officer Patrick Guido, a third-generation cop. His mother, Angel Lifton, is a dispatcher for the PD. Mary Bender came out with the family to support her son, Officer Frederick Bender, who received a commendation of merit. Officer Brian Suschke was recognized for returning a child to his mother after struggling with a perpetrator who stabbed his girlfriend and abducted a child. HAMILTON- Tube socks, $5.99, silk tie, $29.99, a pair of shiny golf clubs, $299.99, taking your dad on a road trip to Washington D.C. for a chance to be a part of history... priceless. Saturday morning, Anwar's Reflections visited the local Kmart in Hamilton Township, New Jersey where disabled military veterans and their families came together to hitch a ride to the nation's capitol with their eyes set on visiting the historic World War II memorial along with the Korean War Memorial and a pit stop at the American Legion. The trip was sponsored by the Disabled American Veterans (DAV) organization along with the VFW Hall. In total, there were around 25 of our nation's heroes on hand. Some in wheelchairs, others still able bodied. Yet they were all donning their specially made hats with embroidery indicating Korea and World War II to symbolize the wars they fought in. When I arrived on the scene, I was greeted by Mr. John Kerrigan, a spokesperson for the Disabled American Veterans organization. He said the event was a great way to honor the veterans. Steve Lawrence, a future soldier was also on site to offer support to the veterans and take in the rich history surrounding the event. He said, "This is a learning experience. Its quite humbling to see all these vets here. They fought for our country". The veterans on site were gracious enough to share their stories. One veteran, Harold Grupon, said he was involved in the invasion of Okinowa. He went on to say that while on radar pick up patrol one day, he and his crew destroyed a magnetic mine while fighting in World War II. 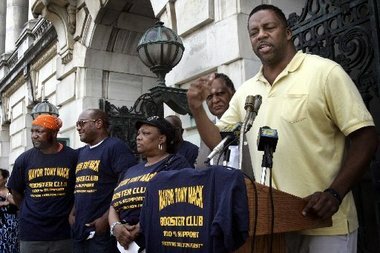 Trenton Activist Daryl Brooks speaking at a pro-Mack rally. TRENTON- Today, Anwar's Reflections sat down with political firebrand, Daryl Mikell Brooks at the Marriott, located in Downtown Trenton, to discuss his thoughts on recent efforts to recall Trenton Mayor Tony Mack by the Committee to Recall Mayor Tony F. Mack, headed by Trenton resident Dave Ponton. 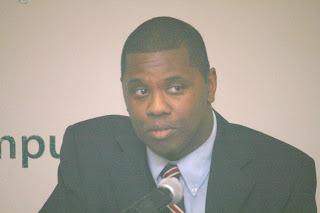 Anwar's Reflections will be sure to keep you up to date on any future developments regarding the potential recall election of Trenton Mayor Tony Mack. TRENTON-- In light of recent reports that the Committee to Recall Tony F. Mack has submitted their official petition to oust Mayor Mack, Anwar's Reflections wanted to go out and gauge public opinion from local Trentonians to see what they thought. Please see the interviews below to get a snapshot of what some Trentonians are saying about the potential ousting of Mayor Mack, also please note that the Committee has brought their petition to City Hall because they claim to be sick and tired of Mayor Mack's lack of leadership. Dave Ponton, a leader of the Committee to oust Mack said, "The final straw was that this city is struggling to stay afloat and he’s allowing his friends to be paid overtime when overtime was actually cut from the city budget". NEW BRUNSWICK--Indeed, life is all about choices and sometimes desperate times call for desperate measures. This seems to be the backdrop to local filmmaker Patrick Pierre's latest movie, Visions of Yvette, which premiered this past Friday at the Crossroads Theater in New Brunswick. The film chronicles the life of Yvette, a young college student that shows signs of potential, but unfortunately encounters the wrong people and gets caught up in a tangled world of drugs and prostitution after making some tough decisions. In spite all this, Yvette, the film's main character, does have a glimmer of hope in her newborn child, Justin. 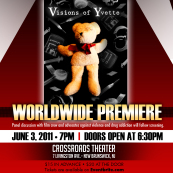 The film takes the audience on Yvette's nightmarish journey through addiction, recovery, and possible redemption. Yet the film also tells the larger story of what it means to survive in a dog-eat-dog capitalistic world where only the strongest will survive. Indeed, when our resources become scarce and our money gets funny, its amazing what desperate things we can sometimes do to get ahead. In the case of Yvette, we find her succumbing to the wishes of Ricky, the film's antagonist played by Brian Watson, a slick-talking character that has a knack for preying on the 'weak'. Yvette gives into Ricky's manipulation after being fired from her hotel management position. She then becomes a call girl who gets up in drugs. After watching Visions, many things stand out. For one thing, the acting was stunning. In particular, I found that Jenna Figueroa's performance as Yvette was powerful. She demonstrated raw emotion, striking intensity, and unbelievable vulnerability. Her performance truly revealed a three dimensional character in the sense that you really got an idea of where she was coming from as a full-fledged human being and not simply a two dimensional caricature. Through her journey, the audience truly saw her ups and downs, her hopes and fears. In her role, I also saw on a larger level a truth that not too many people acknowledge, namely that serious issues can affect middle class households just as much as they can affect lower income households. In this film, we find that Yvette was raised by her mother, Darlene, played by actress Julianne Jones, in a middle class household where there was a strong religious foundation, yet Yvette still took a destructive path in life. In terms of plot and character development, I think Pierre does a good job as well. Through the picture he paints, the audience was able to see where each character was coming from and what they are about early on. Moreover, the plot was not hard to follow either and kept you wondering what was going to happen next throughout the film. However, I was not sure what Pierre was up to when I noticed a shift in the film's color scheme (it went from vibrant color to drab black and white) a third of the way into the movie, and then another shift in color toward the end. Was this intentional? Did the shift in color represent a larger theme in the film, this was unclear to me. Also, the ending of the film left me wondering what next, due to its open-ended nature.I think the filmmaker could have provided more closure for the audience. Overall, the film is powerful. Its realism is unmistakable. Visions of Yvette does an excellent job capturing reality and the possibility of hope and redemption without promising or guaranteeing poetic justice. Fans of Pierre's work came from all around to take a sneak peak at Visions. Cast members and experts in the drug and addiction field took questions from the audience after the film. The world premier was sponsored by two non-profit organizations, the SWS Organization and UIH Family Partners. Anwar's Reflections will be sure to keep you up to date on any future developments. TRENTON--Ever wonder what its like to be put in a situation where tough decisions need to be made as your back is against the wall, well Trenton filmmaker Patrick Pierre, has decided to paint us all a vivid picture of what that's like in his new film Visions of Yvette. Today, Anwar's Reflections sat down with Pierre at the Marriott Hotel in Downtown Trenton. During our interview, Pierre discussed the upcoming premier for his latest project Visions of Yvette. In this film, Pierre chronicles the life of Yvette, a young woman who is ambitious and career minded, trying to live out her dreams. However, on her path, Yvette encounters a series of unfortunate circumstances that can challenge anyone into making poor decisions. 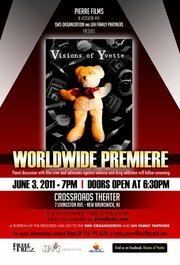 The film's world premier is scheduled for June 3rd at 6:30 pm at the Crossroads Theater in New Brunswick (7 Livingston Avenue), New Jersey. Tickets are currently on sale for $15 (a portion of the proceeds will go to UIH Family Partners and the Samuel Whitfield Simmons organization), all you need to do is click the link: https://www.paypal.com/us/cgi-bin/webscr?cmd=_flow&SESSION=REBsYMatB7kEJ8YQkpuqLvCkOfb1HJ97f2d2di259QQKtbJSgc7FTdNF9Ny&dispatch=5885d80a13c0db1f8e263663d3faee8d422be6d275c375afb284863ba74d6cdc7456ea7 to get a ticket. You can also email Brian Watson: PierrefilmsLLC@gmail.com for more info. TRENTON- Today Anwar's Reflections visited Stace of Cakes Cupcakery located at 11 N. Willow Street near Downtown Trenton and had one of their scrumptious Red Velvet cupcakes. They recently had a grand opening and ribbon cutting. In attendance were Taneshia Laird, the Executive Director at the TDA (Trenton Downtown Association), Mayor Tony Mack, Councilwoman Marge Caldwell-Wilson, among others. The owners, Stacey and Stanley Reece, during our brief interview expressed genuine excitement about the initial impression they have received from their customers since they opened their doors just last week. Prior to their grand opening, the Reece's did not have a traditional brick and mortar facility to deliver their delicious treats to the public. Rather, they had a cupcake truck that traversed the Downtown Trenton area. 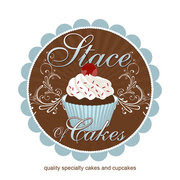 Stace of Cakes offers traditional cupcake flavors like red velvet, chocolate, carrot, lemon, vanilla, and seasonal flavors like caramel apple, eggnog and gingerbread man. The shop carries a variety of desserts and gourmet breakfast and lunch menu items.